What's in store for Nova Del 2013? No one knows what Nova Del 2013 will do next, but there are some tantalizing possibilities. 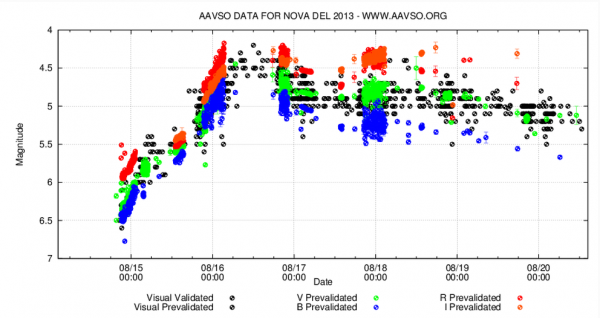 So far it appears Nova Del 2013 is a 'slow nova', type NB in VSX. 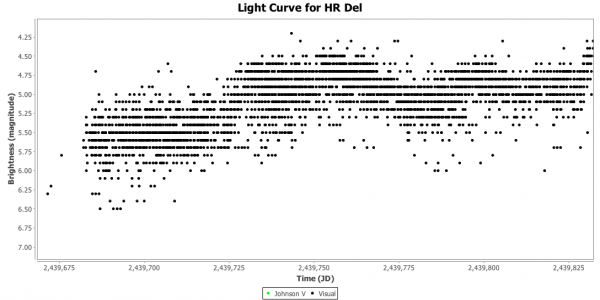 By definition, it takes 150 days or more for a slow nova to fade by 3 magnitudes. Sometimes "or more" can mean a lot of other exciting goings on. 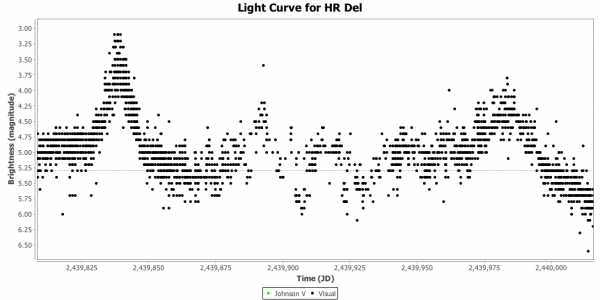 Take another famous example of a slow nova in Delphinus, HR Delphini. Discovered by the famous nova and comet hunter, George Alcock, it erupted to naked eye brilliance in July, 1967. 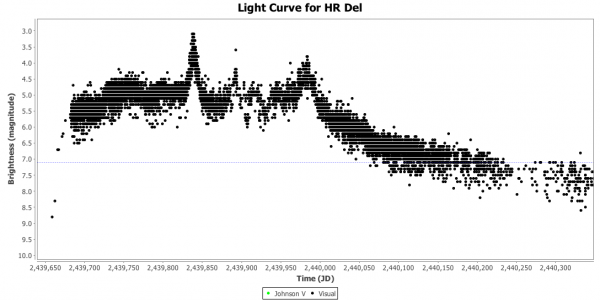 From July 10 to December 1st the light curve looked like this. So we could be in for a months long roller coaster ride. But wait, it gets better. Then it did this! On December 12th it reached a new maximum at magnitude 3.1. By January 4, 1968 it was back to magnitude 5. On February 5th it had another little outburst to magnitude 4.2, followed by some more restless behavior before it gave us one more brightening, peaking at 3.8 on May 7, 1968. 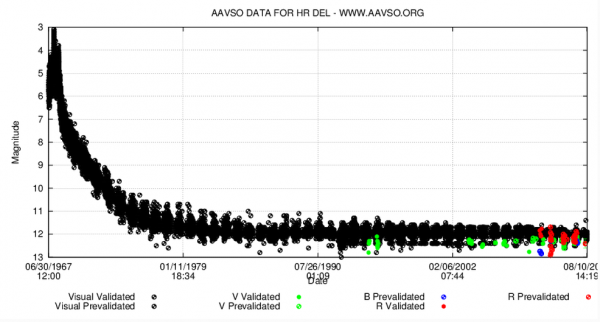 One year after discovery, HR Del was still a naked eye object at magnitude 5.7. It took until January 1969 for it to fade to 7th magnitude. We've been tracking its slow fade ever since. So, is Nova Del 2013 going to turn out to be as exciting as HR Del was? Only time will tell, but there are some interesting similarities. Don't be surprised if we are still talking about Nova Del 2013 next summer.